Multicultural Nonfiction Finalist for the 2017 National Indie Excellence Awards. 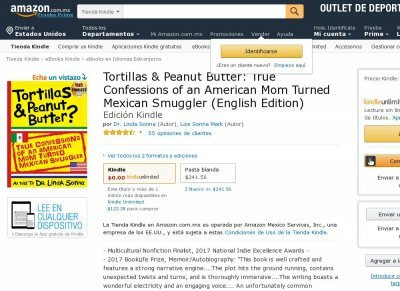 An Amazon Top-10 Bestseller in Humor, BiographyMemoir, Mexican Travel, Crimes Criminals, Solo Travel, Single Parenting, and Teen Young Adult Biography SYNOPSIS A suburban housewife liberates herself from her peanut-butter-and-jelly life and flees to Mexico. While battling the cultural quirks that send less adventurous souls hightailing it back to the U.S., she struggles to learn Spanish, cope with foreign customs, raise her kids, and run a school. To supplement her meager income she smuggles, using her gift for gab and wily wit to outfox the government officials. But not all of her smuggling tricks and tactics go as planned.